How do I love thee, Famous Dave’s? When we’re on our outings, it’s often over a mealtime. While sometimes we pack a lunch or grab fast food, at other times we look for one of our favorite restaurants. Because we have a child with a food allergy, we’ve learned that some restaurants are more allergy-friendly than others. And some restaurants are more kid-friendly than others. Combine an allergy-friendly, kid-friendly spot with some good food, and it’s at the top of our list. Which brings me to Famous Dave’s. 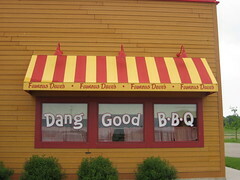 I first ate at Famous Dave’s about 10 years ago. I was married but didn’t have kids yet, and I thought the food was pretty good. My brother-in-law, however, thought it was a really cool place because there’s a roll of paper towel on the table instead of some fancy napkins. At the time, it was just a rib joint to me. Family-friendly was not yet on my radar. Dave’s also gets family-friendly points for the usual kids menus with crayons and activities. Our kids retold the jokes from the menus about a hundred times over the next few days. They have chocolate milk. And they have ribs on the kids menu. Really good ribs for a reasonable price. Prices? For a family that eats around 11 a.m. or 4 p.m. when dining out, you can’t beat Famous Dave’s. They have early bird specials from 11 to 5 (although it varies from site to site–Mall of America’s end at 3 p.m.), with some really good choices for under $10. Our entire family has eaten at Famous Dave’s for only about $8 more than our typical meal at McDonald’s. If the kids menus don’t keep the kids occupied until the food comes, Famous Dave’s is great for a game of “I spy.” We’ve done the entire “find the alphabet” game in there as well. And reading the back of the staff’s t-shirts is entertaining, too. Finally, there’s always music playing at Famous Dave’s. Kind of a Cajun hillbilly style music, and it’s not so loud as to be annoying, but loud enough that it covers up little voices. It’s also the kind of music that kids love to chair-dance to. Watching them be-bop to the beat is one of my favorite Famous Dave’s pastimes. Yeah, we love Famous Dave’s.